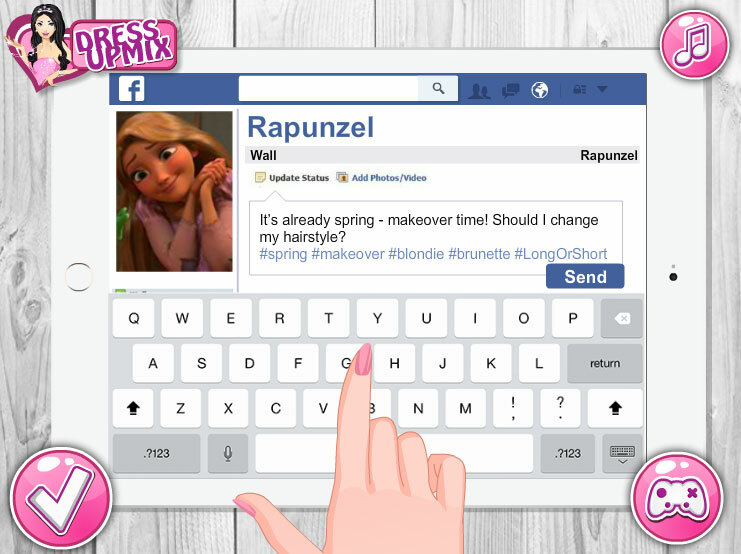 The spring came and the Princess Rapunzel is going to update your wardrobe. She visited many pages of fashionable girls on Facebook and Instagram. She saw a lot of beautiful and modern images, but doesn't know what to stop. Well, that Rapunzel has a friend from Disney! They were divided into two teams. Aurora and Elsa offered her to become a blonde, Snow white and Jasmine would like to see Rapunzel as a brunette. Let's join this fun and friendly group of princesses and find out what girlfriends decided and what is the image created for the cute Princess. After all, Rapunzel is going through. If if she becomes a brunette, she will have to update your wardrobe. And it takes a little time! Played: 70065. Added: 29-04-2016, 16:39.